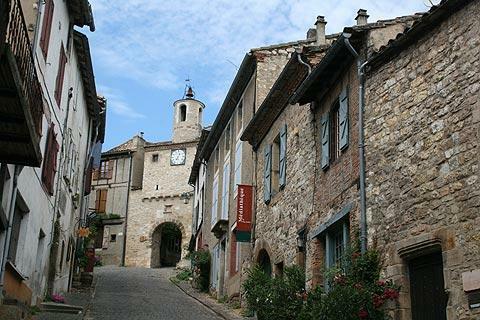 If you are visiting the region north-east of Toulouse a visit to Cordes is an absolute must. No matter which direction you come from, the sudden sight of the town built high on top of an isolated knoll will always take your breath away. 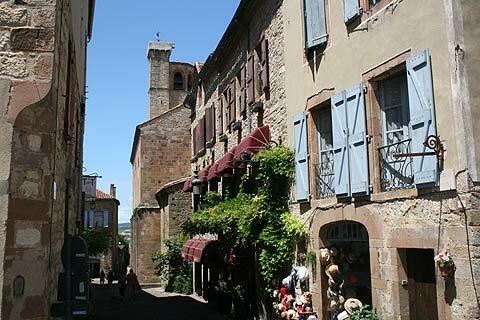 Cordes is particularly famous for the Gothic residences built between 1280 and 1350. This was the 'golden age' of the city which had been growing rapidly since it was founded in 1222 by the Count of Toulouse. It grew so rapidly that new defensive walls had to be built 5 times as the population kept expanding out of the existing fortifications! Trade in wool and leather brought wealth to the city but its importance and population declined when the Canal du Midi was built and Cordes was no longer on an important trade route. Cordes later became an important centre for embroidery and saw a new period of wealth. 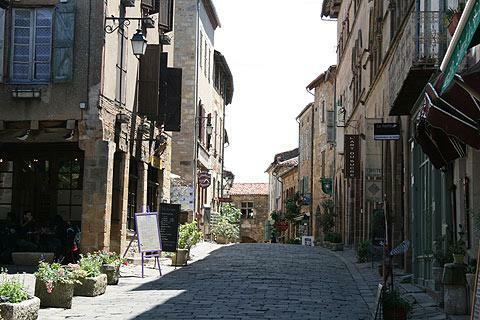 Cordes is a large and amazingly well preserved bastide with dozens of narrow streets to explore. For the photographer there are photo opportunities at every turn of a corner as gothic archways frame beautiful timber framed buildings. 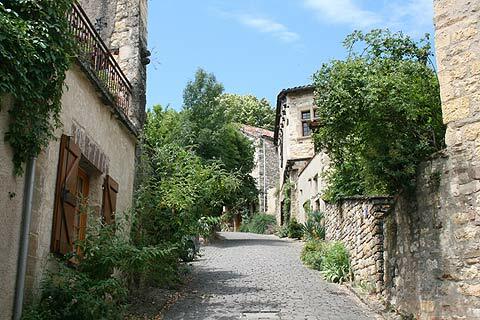 If you visit early or late season you may be lucky enough to see why it was renamed from Cordes to Cordes-sur-Ciel in 1993. Low cloud and mist often shroud the surrounding valleys and Cordes appears above the mist and seems to float in the sky, bathed in sunlight. 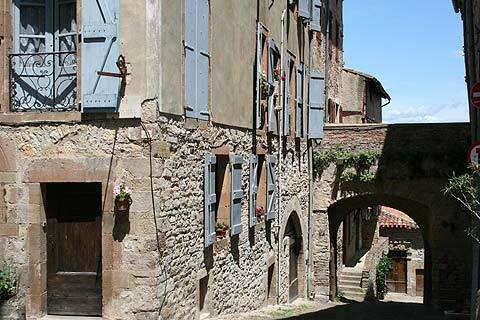 Sadly, unlike many of the smaller bastides in the area, you usually have to share Cordes with numerous tourists. If you do get the chance to visit off-season though, you can find quiet times where it is easier to view and appreciate the architecture without the crowds. 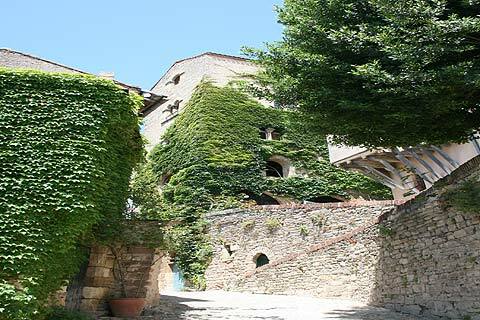 The fascinating architecture of Cordes sur Ciel coupled with its amazing position perched on top of a hill surrounded by the beautiful Midi-Pyrenees countryside makes Cordes one of the most remarkable medieval towns in France. Comfortable walking shoes are recommended for tackling the steep cobbled streets! La Maison Prunet (end 13th century). This is one of the oldest of these houses and has fine arched gothic windows. La Maison du Grand Fauconnier (14th century). A fine sandstone building. La Maison du Grand Veneur (14th century). The tallest of the Gothic buildings with 4 stories. On the second story is a wonderful scene of a hunt sculpted in stone. La Maison du Grand Ecuyer (14th century). Another building with sculptures on the facade, including one of a woman eating an apple. 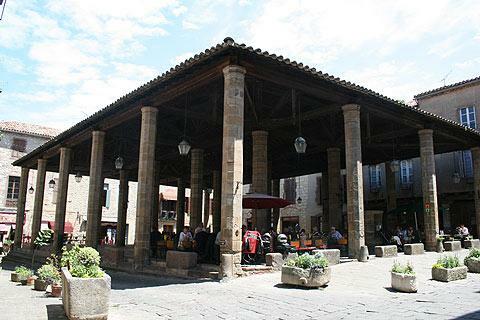 Other places of interest include the market hall and the original entrances through the fortifications. The Halle in Cordes is 14th century and has a 13th century well. It is surrounded by a number of restaurants who have their eating areas under the Halle and is a lovely place to stop for lunch. In the 1940s Cordes was discovered by a group of artists, a tradition which continues today with around 50 artists living and working here. 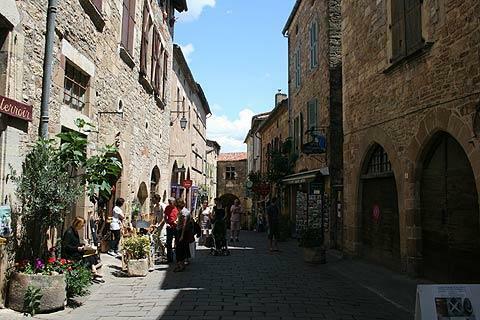 If you love local art and craft shops then you will be totally spoilt in Cordes. There is just about every type of Potter, Artist and Glassmaker you could imagine crowded into this little town and it is very rare for our guests to return home without a picture, painting or sculpture to take home as their holiday memento. Spoilt for choice, a few you might like to try are: The Museum of Modern and Contemporary Art which also houses an embroidery exhibition; the Charles-Portal Art and History museum which focuses on the history of Cordes through the ages; Historama, with its 80+ wax models depicting life for the middle classes in the middle-ages; and for those with a sweet tooth a visit to the Musée de L’Art du Sucre is an absolute must. There are numerous festivals held throughout the season some of which literally take over the town. 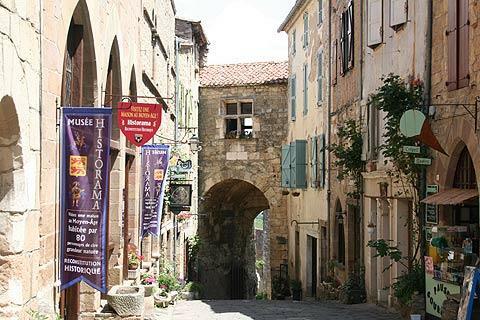 A fun one for all the family is the Medieval Festival of the Grand Fauconnier where visiters are encouraged to join in the fun by dressing in medieval costume and then enjoying the spectacles of street theatre, demonstrations of medieval crafts and also see local birds of prey. For music lovers the Classical Music Festival is a must, with concerts held throughout the town in exquisite settings. Children tend to really love the Jousting Tournaments held on the outskirts of the town where they can cheer on their favourite. 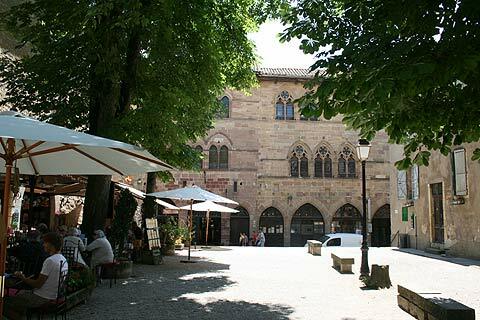 Cordes-sur-Ciel is an excellent place to eat out – either enjoying a cheap and cheerful lunch under the shade in one of the two central squares or choosing a more sophisticated option in one of the many restaurants available. 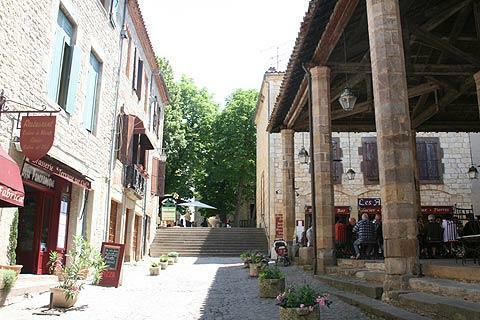 For a really romantic evening meal you can’t beat the atmosphere in Cordes at night and there are a lot to choose from, perhaps a special meal in the Michelin acclaimed LeGrand Ecuyer,or maybe even a medieval banquet at l’Escuelle des Chevaliers. 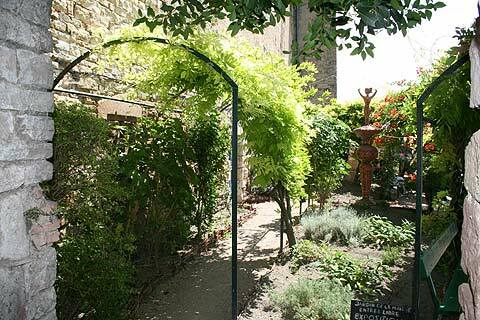 There is a wonderful garden in Cordes sur Ciel, 'The Jardin du Paradis'. It is just on the edge of town and is made up of lots of garden rooms which flow easily from one to another. 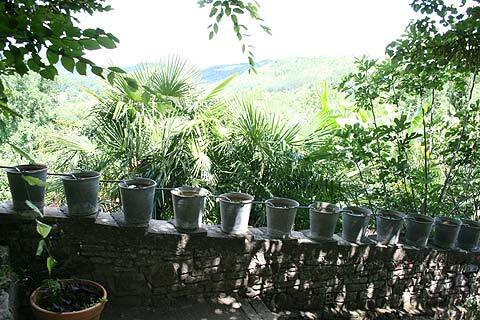 Virtually every one contains interesting ideas or plant schemes that you can take back to your own garden. There are many designated parking areas in and around Cordes but some can leave you with quite a hike to appreciate the old town. During the summer months our preference is to park just inside the newer town boundary and head for the central square. From here you can pick up the little tourist train which will take you up the back streets and drop you off at the entrance gate to the citadel, then you have the choice to either slowly meander through the old town and back down the steep cobbled streets to your car, or pick the train back up again and get dropped off at your starting point. A little way north of Cordes-sur-Ciel at Ginals is the attractive 12th century Beaulieu Abbey. 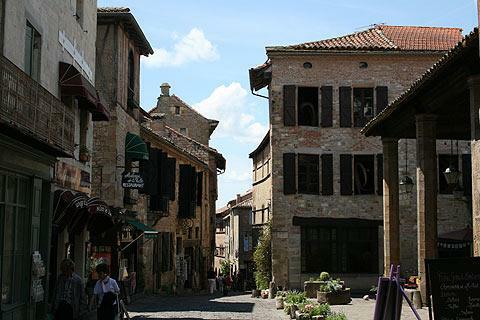 We also highly recommend you visit the historic towns of Albi, Gaillac and Najac. None of these is very far from Cordes, all three are quite different from each other, and each of them has a great deal of charm.